ROARING FORTIES™ PFDs are light in air & in water. Hence it is very comfortable to wear them for longer periods. It will also provide a high & safe freeboard in water (ie the vertical distance between the mouth & the surface of the water). Our PFDS will right a person in a safe inclined angle. By using a specialised uncoated warp knit polyester fabric, ROARING FORTIES™ RB240 series PFDs has excellent permeability of water in and out of the fabric & thus providing stability in performance & consistency in buoyancy. Our fabric has a colour fastness to light reading of 4-5 on a Blue Wool Standard & colour fastness to seawater reading of 4-5 on a grey scale. With these inherent features, ROARING FORTIES™ RB240 series PFDs perform much better than others when exposed to the above conditions. Apart from fungus resistant, Roaring Forties fabric is more resistant to chlorine attack than the average fabric. ROARING FORTIES™ PFDs use loose sheets of closed cell foam. This ensures ROARING FORTIES™ PFDs are soft, light, durable, dependable and very comfortable to wear over long periods. Also the soft touch is design to prevent serious injury when alighting a craft. ROARING FORTIES™ being outcome focus, also caters for larger sizes people & people with disabilities. 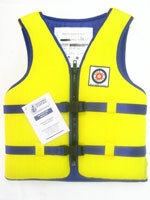 ROARING FORTIES™ RB240 series PFD Type 2 for Children & Adult is light and is very comfortable to wear. Our emphasis is on comfort & lightness in air & in water. ROARING FORTIES™ RB240 series Type 2 PFD for Child and Adult is a deluxe model. It is quilted & expandable to a certain length on the sides. Very popular with corporate users. We allow corporate logos to be incorporated onto the PFDs. Users include coastal fish farmers, Victorian MMFB etc.